This is a very tasty and easy to make dish. We often make it for breakfast. 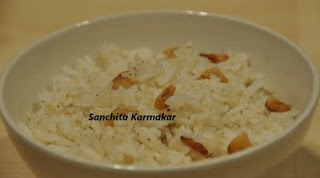 Poha is actually flattened rice flakes, can be found in any Indian grocery store. In Bengali we call it "chire". 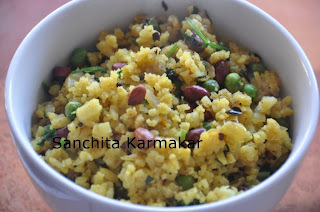 Usually there are three types of poha available in the market, thick, medium and fine. I use the medium one for this preparation. Heat the oil in a pan and fry the peanuts and keep them separate. Now add the mustard seeds in the remaining oil, once it starts to splutter add the onion, chillies and ginger and fry for a minute. Now add the salt, cumin powder and turmeric powder to it, mix well then add the boiled potato and the peas in to it and let it cook for few minutes. Soak the poha in cold water for only a 1-2 minute, no more than that otherwise it will become like mash which you don't want. Drain the water and add the poha to the mixture in the pan and mix it well. If you think the mixture has become little dry sprinkle some water to it. Cover and cook for another few minutes. Now add the lime juice, fresh chopped coriander and the fried peanuts. Mix well, take off the fire and serve hot with tea or coffee. Lentils are source of proteins. There are several types of lentils available in the market and each one of them looks and tastes very different form each other. Today, I am using green whole mung dal for this soup. The method is quite simple and easy if you are comfortable using pressure cooker. Heat the oil in the pressure cooker, add the ginger and garlic to it and fry well. Now add the onion and fry till golden brown. Add the tomatoes, all the spices and keep cooking for 2 minutes. Now add the potatoes mix well and cook for a minute or so. Make sure all the potatoes are coated well with all the spice and onion tomato mixture cooking in the cooker. Now add the soaked dal to the mixture give it a good stir and then add 300mls of boiling water, add salt to your taste, mix well then cover the cooker and let it cook till 3 full whistle and then turn off the heat. Do not open the pressure cooker immediately let the cooker release the pressure slowly and when its done then open the cooker. Give it a good stir again, check the seasoning and most importantly the consistency of the dal. You can add more boilling water to to make it dilute or boil the dal for few more minutes to increase the consistency. It really depends on you and how you would like it. 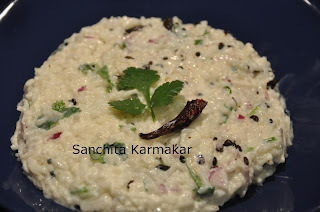 Add the green chillies now and serve hot with rice or bread of your choice. You can make it a richer by adding cream and butter before serving the dal. Now how much cream and butter to add? That's really up to you. Garnish with chopped fresh coriander and serve it hot. Simply heat the ghee/butter and fry the garlic. When the garlic is almost done add the crushed black pepper and salt, now mix it with the rice. Eat it hot you will feel good. Note: You can vary the quantity of the ingredients as per your taste. Birthday without a cake is unthinkable! So, I thought of baking one and not just any cake its a chocolate and coffee cake. Its a home-made cake so nothing fancy but something made with love and a bit of butter (may be more!!). Melt the butter, beat the eggs and add it to the melted butter and continue beating. Now add the sugar and continue beating until the mixture becomes homogeneous. In a separate bowl mix the flour and the baking soda, slowly add that to the mixture and keep beating so that there are no lumps present. Now add the melted chocolate and the coffee in to the mixture and keep beating. 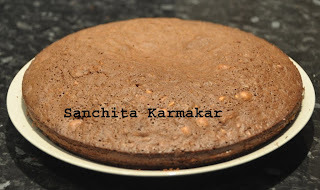 I use an electronic hand blender to beat the cake mixture, it comes out well and less hard work! When you get the consistency (like honey) and the you see bubble forming in you mixture as you stop beating, that means your mixture is ready. Add the crushed mixed nuts to it and mix well. Preheat the oven at 200 degree centigrade, butter your cake tin and pour the cake mix in the cake baking tin. Now place the tin in the centre of the oven and bake for 25-30 minutes. Use a long pin to pierce in the cake, if it comes out clean that means you cake is done, else bake the cake for some more time until its done. You might consider bringing down the temperature as it might result in burning the top surface of the cake. Once cooked, let it cool then serve hot. Enjoy!! Note:I usually use a 8" tin to bake, because it takes less time to bake and the surface area is big so the cake gets cooked evenly.